Creekside Spa is a luxurious facility, owned and operated by Andi Burnite and Mary Larson. Andi and Mary have been practicing massage since 2004. Both are Colorado registered and insured therapists. They love the outdoors and cherish their time spent in the majestic mountains of Crested Butte. Your experience at Creekside Spa will take your vacation, and health to a higher level. A variety of treatments are offered to meet your unique and individual needs. Be prepared to be pampered as you relax and unwind. Anticipate relaxation, rejuvenation and experiencing the difference that a day at Creekside Spa will make in your life. My path of spirituality and healing began in 2012 at the age of 20 when I was in yoga teacher training in Fort Collins, Colorado. I have always been drawn to natural medicine and energy, but once I started moving my body in ways I had never before, my life started to change. During my training I was introduced to massage therapy through physical adjustments made in a yoga class. From there I was hooked and I couldn’t believe the healing unfolding right before my eyes, within myself and others. I began massage school that following spring in 2013 and graduated a year later from the Denver School of Massage Therapy program. With over 800 hours of training in school I studied various modalities such as cranial-sacral therapy, shiatsu, trigger point therapy, myofascial release, and reflexology. Since my initial massage program I have moved on to studying Thai yoga massage and I’m now a reiki master. I am passionate about mountain life and the people that live the life they love. I wish to encourage personal growth and healing through mind, body and spirit. I was inspired to become a massage therapist, after I fell in love with the healing art, when I received my first massage. I have been practicing massage therapy, since graduating from Mountain Heart School of Massage, Crested Butte, CO, in 2005. I hold a dual degree in Environmental Studies and Chemistry from Western State Colorado University, where I also studied Anatomy and Physiology, and had the excellent opportunity to work with cadavers. I have received continuing education in Osteopathic Massage Techniques, Ortho-bionomy, Sports Massage, Indian Energetic Massage, Reiki, and Student Teaching. I love being a massage therapist, because it is a living that integrates my knowledge, and shares love and happiness with the world by helping people feel good. When I’m not giving massage, I enjoy being outside: mountain biking, skiing, hiking, and camping (of course). I also enjoy drawing/painting (artist of Mountain Express bus, “One Love”), volunteering, cooking, reading, and generally trying to understand more about the world we live in. I started my journey into health and massage when I was eighteen. I attended The Healing Arts Institute in 2010 and was instantly drawn to helping others heal. I grew up active, playing hockey and snowboarding, so my interest naturally went towards sports related massage. I've used my career to travel the world, living and working in Silverthorne, Fort Collins, and New Zealand. I've extended my studies in Thailand and with many courses in Denver. I love to try and and continue my education as often as possible to constantly bring in new techniques to my practice. My favorite part of massaging is the happiness you bring people when they no longer have the mental or physical discomfort they came in with. I enjoy going to work everyday presented with new challenges to overcome, it keeps me on my toes and makes work fun and fresh. I am a licensed massage therapist and graduated from the Southwest School of Massage in November 2015. My main focus is deep tissue massage and I provide a specialized treatment that is tailored to each client’s specific needs. I incorporate tuning forks, essential oils, and massage cupping into my practice, and am also a certified Reiki practitioner. I have been a certified massage therapist since November of 2003. I graduated from Mountain Heart Massage School located here in Crested Butte, Co. I study Ortho-bionomy and have been practicing and incorporating it into my bodywork since 2007. I love being a massage therapist. It is so rewarding and such an amazing line of work to be in. I get to learn so much from each and every body I work on. I have been living in Crested Butte since June of 2002. My husband is a carpenter and builds beautiful homes. We have two young boys and all love skiing and snowboarding in the winter and in the summer we enjoy biking and hiking. Crested Butte is such a special place to live or just vacation in. George has worked with his hands for the majority of his professional career. Cape Cod, Massachusetts is where his career as a professional gardener began, creating and maintaining residential gardens. The love of the outdoors led him to Maine, where he continued gardening professionally for a number of years. Initially, his interest in cycling led to his first massage, thus the idea of actually practicing massage was born. It was an intuitive and logical move to continue working with his hands in this manner. George followed this interest and moved to Colorado, a place that he wanted to return to. Studying massage therapy at Mountain Heart School of Bodywork landed George in Crested Butte where he now practices. When not working with clients, George can be found experiencing the beauty that Crested Butte has to offer…and petting any dog that may cross his path. Joelle Haley has been practicing massage therapy for ten years. She has experience in working with all different body types. She enjoys meeting new people and working with a variety of people. Her favorite activities are to hike and ski with her two Huskies. Renee moved to Crested Butte in the winter of 1984. For a nature lover from Tennessee who guided river rafts and led backpacking trips, Crested Butte was an ideal home. Throughout her college career, Renee's forte was in anatomy and physiology with an emphasis in sports related medicine. Her interests led her to Mountain Heart School of Massage and Bodywork where she studied a variety of modalities including Swedish Massage, Deep Tissue/Neuromuscular, Prenatal and baby massage, Hot stone therapy, Energy work and Acupressure. Renee finds great joy in working with her clients at Creekside Spa. In addition to being a massage therapist, Renee is passionate about her amazing family, her dear friends, skiing, mountain running, mountain biking, hiking, banjo playing, music, art, animals, and traveling. Nordic skiing, and gardening. Georgia is super excited to join our group of therapists at Creekside and looks forward to seeing you here. Helen's love of wellness in the body started 20 years ago. Graduating from college with a BS in Health Sciences in Athletic Training, medically taking care of sports teams, she knew there was more to wellness and healing than just ice and exercise. Even in the training room she used her hands to intuitively work with injuries and help athletes heal faster. In 2005, she attended the Northwest School of Massage in Seattle where she graduated with over 500 hours of training. Since then, she has worked in many settings with many clients. Her intuitiveness as well as Reiki training helps her to connect with her client, and hold tremendous space for them while they relax and heal. Born in Colorado and raised in Montana, I have always found home to be in the mountains. I earned my BS in Wildlife Biology in Missoula, but I always felt driven to help people. After some injuries, I grew a better awareness of the body and its resiliency. To be able to understand and communicate with the body is a powerful skill that we all have, and I wanted to learn more. 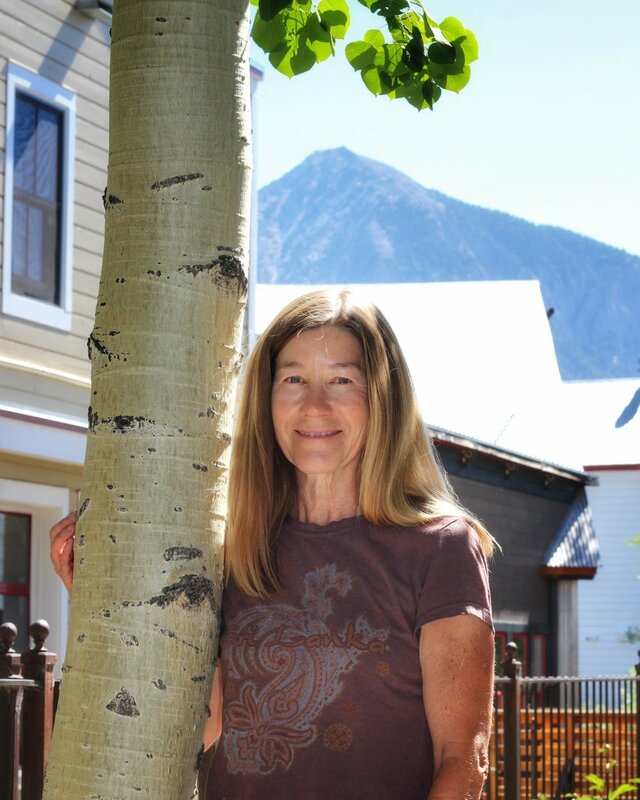 I came to Crested Butte in May of 2017 to study massage at Mountain Heart School of Bodywork. I have been absolutely loving this 'job' because the body is a puzzle, and it is an honor to be part of the process of healing and wellness. Living in such a supportive, active, and beautiful community continues to be an amazing experience that I hope goes on and on. Andi Burnite and Mary Larson have been practicing massage since 2004. Both are Colorado registered and insured therapists and highly trained in a variety of therapeutic modalities. After working together for 2 years they saw a need for a downtown spa that offered both convenient and consistent hours as well as quality treatments. So, in the fall of 2011, they established Creekside Spa. They are proud to provide a professional and inviting space with skilled and reliable therapists for visitors and locals. Besides managing the spa, Andi has a thriving massage practice at the spa and is a busy mother of 2 young boys. In addition to managing the spa, Mary is co-owner of Mikey’s Pizza. They both love the outdoors and the community and cherish their time spent in the majestic mountains of Crested Butte with friends and family.